In order to support the Food Security Act, the Ministry of Agriculture has estimated that the essential foodgrains in India, to the extent of 53 million tonnes be maintained as a buffer stock. This is based on the assumption that it is safe to have this divided into three categories. A three month buffer stock, at the rate of 5.1 million tonnes (mt), three months reserve and a strategic reserve of 7.5 mt would be sufficient, as a start, as per Tejinder Singh, a well known foodgrain trade analyst. Also, we must remember that as fresh supplies are coming in, stored materials are also being despatched continuously for daily consumption. The foodgrains in overflowing godowns are stored, in large quantities, outside under plastic sheets, tarpaulins etc, which are subject to heavy climatic damage, besides being vulnerable to pilferage and act as a regular storehouse for rodents! Any excess inventory of even 13 to 15 mt are estimated to be worth Rs32,500 crore to Rs37,500 crore! According to information available in the media, as of December 2013, the stock level of foodgrains with the Food Corporation of India (FCI) stood at 45 mt, some 20 million more than required, based on the estimation of 5.1 mt per month. This figure varies from time to time, based on consumption pattern, arrivals and despatches. We must also bear in mind that most state governments have their own food subsidy schemes, and there is no uniformity on a national scale. Our foodgrains should be sold, on export basis, at the best possible prices in the overseas market, and our own minimum “floor price” rules have no bearing on the purchaser. Fresh supplies to the godown are simply placed on the top of the heap of the lot already in, which causes irreparable damage at the bottom! Take the question of wheat stocks in the country and the overseas demand pattern, apart from the aggressive activities of our competitors. At this point of time, cold weather conditions in the US, prime and leading grower and exporter, are indicative of shortfall in their supplies. Indian wheat stocks, as on 1st December, stood at 31 mt, which is the statutory requirement for buffer stock. Agricultural experts estimate a bumper crop this season, amounting to over 95 mt, as wheat acreage in the current rabi season is estimated to be over 302 lakh hectares, thanks to various state schemes in operation. In Madhya Pradesh, the government had announced a bonus of Rs150 per quintal over the minimum supportprice (MSP) and it appears more farmers increased the wheat acreage! The central government had announced a MSP of Rs1,400 per quintal, an increase of Rs50 over the previous year, to encourage production. As a sequel to the bulging stocks of wheat, export efforts by government authorities, besides private exporters, are bearing fruit. Fortunately, in line with the international market, the government had to reduce the floor price from $300 per tonne to $260 per tonne to push up exports and to literally get rid of the stocks, and to make way for the new crop to come in. Preferred supplies from Black Sea producers were fetching $305 per tonne, while both US and French supplies were quoted at about $ 300 per tonne. However, with the cold wave, there has been interest in the tenders called for by India,prices above the floor price of $260 per tonne has been obtained, such as $282.62 per tonne from Vitol Group, for shipment from Mundhra port, while Al Ghurair of UAE bid $ 283.60 per tonne for shipment from Chennai. India thus plans to export at least two million tonnes of wheat before the new crop starts arriving in April, with hopes to reach four million this fiscal, as there are several tenders on the anvil. Other items like corn (maize) have also made headway in exports, with orders booked for 350,000 tonnes at $216 per tonne. Iran has increased its purchase of basmati rice and soya meal with other items like sugar picking up. Our efforts to push up export of foodgrains is imperative; at the same time, there is an urgent need to encourage corporate bodies to invest in building up the infrastructure facilities for storage, but allocating free land or on long term lease, suitable for this purpose, in every state and more importantly near the ports to facilitate exports. Anything that can be done in these areas to prevent loss of foodgrains due to climatic damage would be most beneficial to the country. BHUBANESWAR, India, Jun 21 2013 (IPS) – Shooing off a quartet of hens that come pecking, 24-year-old Kamala Batra sits guard over a sack of coarse rice spread out on the courtyard. After small black insects slowly crawl away in the sun’s heat, she gathers it to cook for the day’s free midday meal – a pan-India government food security scheme for students. Batra, a member of the women’s collective that cooks school meals in Kosagumuda village, in the tribal Nabrangpur district of the eastern state Odisha, says government supplies of old and almost inedible food grains under the subsidised public distribution system are not uncommon. A recent report from the national auditor, tabled in parliament, found that India did not have space to store 33 million tonnes of foodgrain worth 12 billion dollars, which it had bought from farmers for various government food security schemes. “Thirteen percent of [India’s] gross domestic product (GDP) is wasted every year due to wastage of food grains in the supply chain.” — Dinesh Rai, India’s Warehousing Development and Regulatory Authority. This constituted a 40-percent shortage in storage space, for a total stock of 82 million tonnes that was held by the Food Corporation Of India (FCI) in June last year. A 1964-born monolith under the Ministry of Consumer Affairs, Food and Public Distribution, FCI procures, disburses and maintains buffer food grains, mainly rice, wheat and coarse grains, countrywide. FCI has recently resorted to wheat export to ease the storage problem. “How will it handle additional quantities that will have to be mandatorily procured when India formalises the National Food Security Bill (NFSB)”, asked food security activist Badal Tah from tribal populated Rayagada distric, which in 2002 saw a national uproar over deaths due to starvation. Malnourishment and inequitable access to food are unwieldy issues India is currently grappling with as the U.N. Millennium Development Goals (MDGs) reach closure in 2015. The NFSB will provide legal entitlement to subsidised food grains to around 67 percent of India’s over-two-billion population. It is likely to cost the exchequer about 21 billion dollars. Tah is joined by a strong section that says India may well be comfortably placed in regard to the availability of food grains, but its present infrastructure and approach to crop management need structural changes before it can implement the food security law. The bill has been debated in parliament since December 2011. Assessing a five-year period from 2007 to 2012, a recent report of the Comptroller and Auditor General of India (CAG) tabled in parliament in May of this year, severely indicts the FCI for colossal mismanagement in food procurement, storage and evacuation. According to the report, FCI has gone on procuring, even though last summer about nine million tonnes of grain lay around in open spaces to deteriorate in monsoon rains. What’s more, grains from 2007 were still unused and rotting in 2012, because the first-in-first-out policy of supplying older grains before newly procured ones was not observed. Old grain was left to deteriorate in storage – infested supplies like the ones Kamala Batra was sun-cleansing in the courtyard. While a volley of recent studies reiterates colossal food wastage owing to inadequate and unscientific storage infrastructure, up to 20 percent of India’s population live on 1.25 dollars a day. A 2013 report from the London-based Institution of Mechanical Researchers, “Global food: waste not, want not”, finds India wastes a quantity of wheat equivalent to the entire production of Australia every year, of which 21 million tonnes perishes every year due to a lack of inadequate storage and distribution. FCI itself admits India lost 79 million tonnes, or nine percent of total wheat produced over a four-year period from 2009 to 2013. “Thirteen percent of the gross domestic product (GDP) is wasted every year due to wastage of food grains in the supply chain,” said Dinesh Rai, a senior official of the federal government’s Warehousing Development and Regulatory Authority. Aside from food grains, India loses 12 million tonnes of fruits and 21 million tonnes of vegetables every year due to a lack of cold storage facility, according to a 2009 study by the United Nations Environment Programme (UNEP). In India’s remote areas, in a bumper harvest year, fast perishable vegetables like tomatoes are sold at dump prices for two rupees, or 25 cents, per kilogramme. Lack of storage is a major tool in the middleman’s hands to exploit the small farmers. “We wait for government procurement officials to get the minimum support price (MSP), but they have delayed these last two years,” Raju Jani told IPS from Odisha’s Koraput district. They are heavily in debt, he said, for things like seeds and fertilisers, “So we give our harvest to the rice miller’s agent for whatever price he offers”. With storage space shortfall and a go-slow government procurement, farmers are caught between the devil and the deep blue sea – the loan shark and the middleman. The CAG report has questioned the basis for high a MSP, which is being viewed increasingly as a political sop to voters. According to current rules, if farmers come forth to sell at MSP, the government cannot decline to buy or set a cut-off procurement quantity. This is yet another reason for excessive procurement of food grains over the last few years. It however benefits the large landholders more, say a section of political observers. In 2012, it cost the federal government 16 billion dollars to overall handle the grain it bought at MSP, including transportation, storage and other overheads; its subsidised disbursement, in turn, fetched 4.7 billion dollars. With the food security law, the government would procure much larger quantities for distribution, at subsidised prices of one to three rupees (about 0.02 to 0.05 dollars). 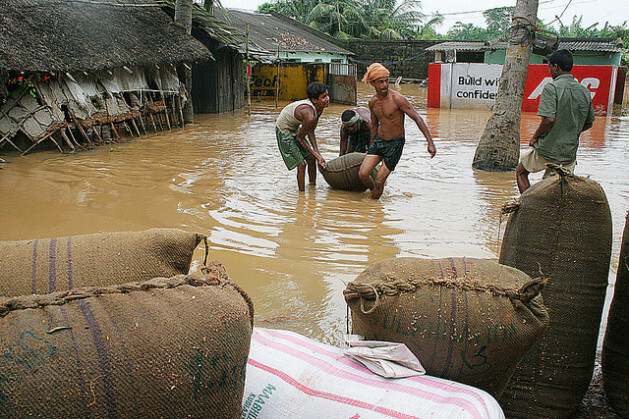 Amid the losses, many NGOs are calling for the reinstitution of village level grain banks. “Farmers lost their self reliance, all because of the centralized food production of wheat and paddy. Multi-cropping should be brought back,” Thooran Nambi, of the Tamil Nadu Farmers Association, told IPS from Coimbatore, Tamil Nadu State. He’s in favour of abolishing subsidised food for rural people, saying it should be given during emergencies only, he added. In its study, the Institute of Mechanical Researchers recommends developed nations transfer their engineering knowledge, technology and design know-how to developing countries.